I just bought a used road bike. it is a miyata 721A. first can anyone tell me about this bike? second. can I buy any road bike parts such as crank, brakes and brake levers? Not replace parts? I always found if the frame is in great condition (along with all the races,dropouts,etc.) is fine to replace the older parts with new. That is if one finds a decent bike and the cost of the parts do not exceed the price of a new one. If I misunderstood,sorry ,please do feel free for correction. Yeah, the "decent frame" + "price of components not exceed new bike" is the tricky part. Don't get me wrong, I have an old Peugeot I bought used that was my first road bike, and I still like it. I replaced quite a bit of stuff, tweaked things, had problems caused by old French stuff (bottom bracket, brakes)... I probably ended up paying as much as an entry level bike costs these days (I really don't want to think about the numbers) and I have not even replaced the shifters and derailleurs... so: yes, you can do it, no, economically it is mostly not feasible. If you buy new components (group + wheelset + saddle + other stuff) you pay almost the same as if you just went for a new bike. Having said that, used or "older" (last or before last year) stuff can be an alternative. Just my $0.02 on replacing parts on an old bike, I think Bill and Joe are both right, depending on what you need to replace and what your objective is. If it's to take an old mid-range bike and turn it into a new mid-range bike for the same intended usage, essentially a newer version of what it was, replacing major components is not worth the cost. Instead, overhaul all the bearings, replace the chain, cables, tires, tubes, rim tape, and bar tape/grips. Clean, lube and adjust everything and then ride it. That will still set you back $100 - $200, but those are essentially consumables—you pay for them one way or another on every bike over time. If, on the other hand, you want to turn an old bike into a different kind of bike, for example turning an older ChroMo mountain bike into a grocery getter, it can be cost-effective with the right parts selection, and be personally rewarding. Actually both scenarios are rewarding, and will teach you about how bikes work. I think the deal-breaker in either one is finding major components like the crank-set, wheel-set, brakes etc. unserviceable with no choice but replacement. Hmm... I'm rambling... feeling a bit loquacious as usual. Don't mind me, and of course the above are just my random thoughts from my experience and observation... certainly not some suggestion of expertise or authority. I'll agree with both of ya. General maintenance is one thing. To get brand new parts to make it original may not be cost worthy unless one is "restoring an antique" or the cost of the items are well low priced. 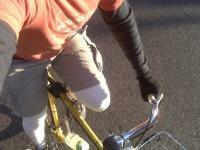 An example is I have a 1965 Armstrong 3-speed. When I get extra time I work on restoring it. Now if I am at this old antique place and see a vintage seat for 2.00-3.00 dollars I'll splurge, buy it, and of course take it home put it on the bike lol . If it were more then that I would pass it up. One's ramblings maybe another's help . This Miyata was avery nice touring bike. It had a aluminium main frame with a " bonded " cro-moly rear triangle section. Also had a cro-moly front fork. Down tube shifters and pretty nice componets. Im not sure what the 'A' refered to tho. Think this was made in the early 90's. Go to http://www.miyatacatalogs.com Complete catalogs on line w/ all frame specs. My advice, lose the friction shifters if you plan on rideing it alot. You can find indexable down tube shifters on ebay. (shimano 600 , mabey others) Hope this helps! Merry Christmas.